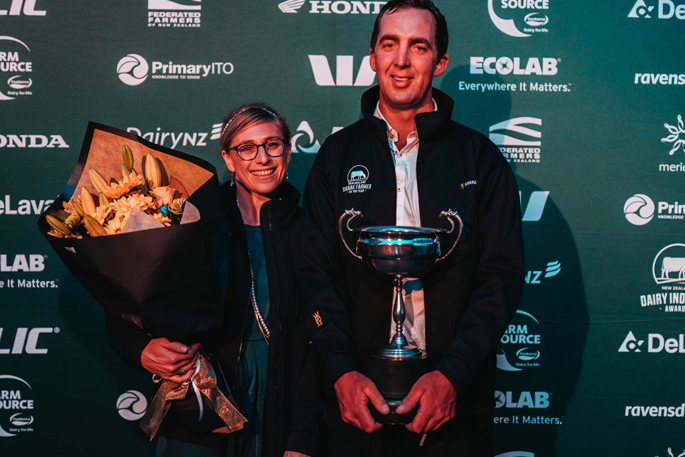 The 2019 Bay of Plenty region SFOTY winners Genna Maxwell and Matt Barr. Major winners of 2019’s Bay of Plenty Dairy Industry Awards, Matt Barr and Genna Maxwell, believe one strength of their business lies in being fourth-generation custodians of a family legacy, with opportunities for diversification. The couple are the region’s Share Farmers of the Year – announced at the BOP Dairy Industry Awards annual dinner last month at the TECT Action Centre Pongakawa. Here Janamjot Singh Ghuman was named 2019’s BOP Dairy Manager of the Year, and Alex Sainty is 2019’s BOP Dairy Trainee of the Year. Matt and Genna, are lease farmers for Viv Barr, on her 110ha, 410-cow Awakeri property. “Viv is an actively supportive landowner,” they say. Matt holds a Diploma of Farm Management from Lincoln University and Genna a Bachelor of Law from University of Otago. “Genna works off-farm as a lawyer and works on-farm in her spare time. Entering as a couple made sense as it was another great way for Genna to integrate her skillset into the business and gain a wider understanding of the farm business operation,” says Matt. The couple won $9050 in prizes and three merit awards. Their future goal is to fulfil their vision of a sustainable, diverse business and a balanced life. Runners-up in this competition are Jeremy and Melissa Shove, who won $4387 in prizes and four merit awards. They’re contract milkers on Kay and Michael Watkins 116ha Whakatane farm, milking 385 cows. Janamjot Singh Ghuman, who is 2019’s BOP Dairy Manager of the Year, came from a farming background in India and became eligible to enter the awards this year due to visa criteria changes. Janamjot, aged 26, won $6725 in prizes plus two merit awards and is farm manager for Rex and Lesley Brown on their 65ha Te Puke farm, milking 280 cows. He holds a Diploma in Applied Technology from the Wairakai Institute of Technology and Primary ITO National Certificates in Agriculture Level 4 and 5. Joseph Braybrook, aged 22, was second in this competition, winning $2400 in prizes and one merit award. He’s farm manager for Henry by-de-ley on his 135ha Paengaroa property, milking 400 cows. Te Puke farm manager Ashley Weld, 23, placed third and won $1575 in prizes. He works on Gerard and Karen Weld’s 64ha farm, milking 180 cows. Alex Saint, aged 21, who is 2019’s BOP Dairy Trainee of the Year, won $5250 in prizes and two merit awards. He’s assistant manager for Peter Overdevest and Tania Akehurst on their 390-cow, 132ha property at Galatea. Runner-up in this competition was Thornton herd manager Justin Bell, aged 21, who works for Hayden Power on his 120ha, 400-cow property. He won $1250 in prizes and two merit awards. The BOP Dairy Industry Awards winners’ field day is on April 8 at 1286 State Highway 30, Awakeri, where Share Farmers of the Year, Matt Barr and Genna Maxwell lease.